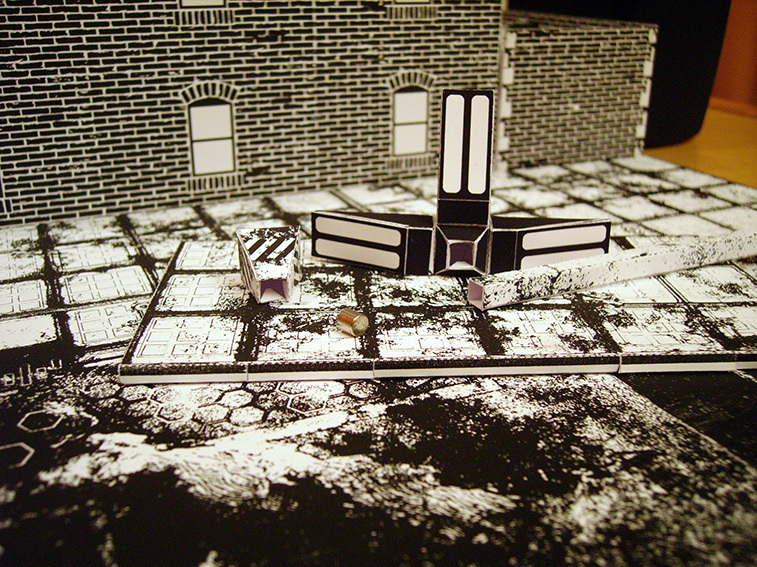 Future Noir - Update Nov 04: First game pics! Horse d!ck! You are the Blade... Blade Runner. Time for another cardboard project. 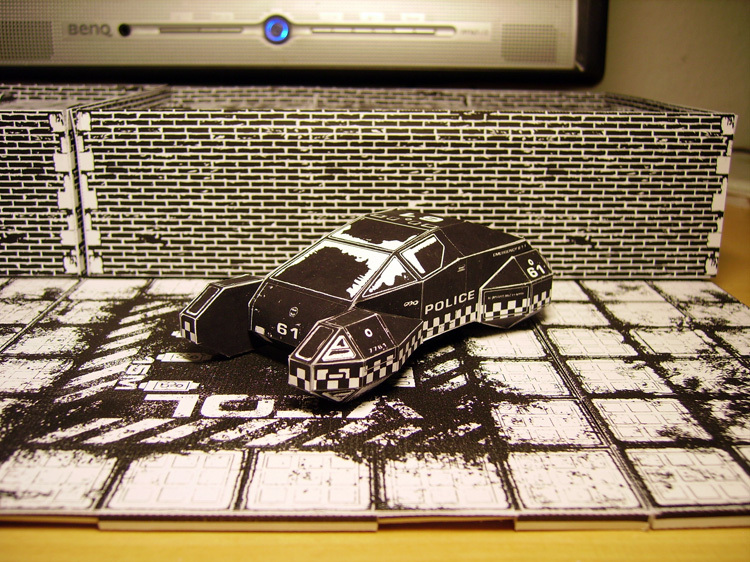 After quite humble beginnings, I somehow got bit by the Blade Runner bug and decided to combine both projects. This meant completely scrapping the narrow-focused 40s Film Noir-approach with only the most basic scenery and going full-out for a glorious near-future city with buildings, vehicles, pedestrians and whatnot. All in cardboard, of course. 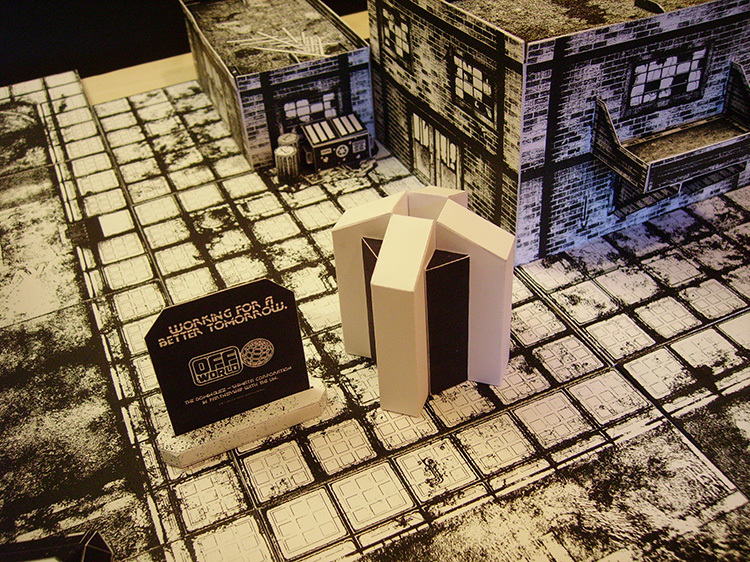 I decided early on that I would keep two things: The Pure black & white look and the Standees I already made. 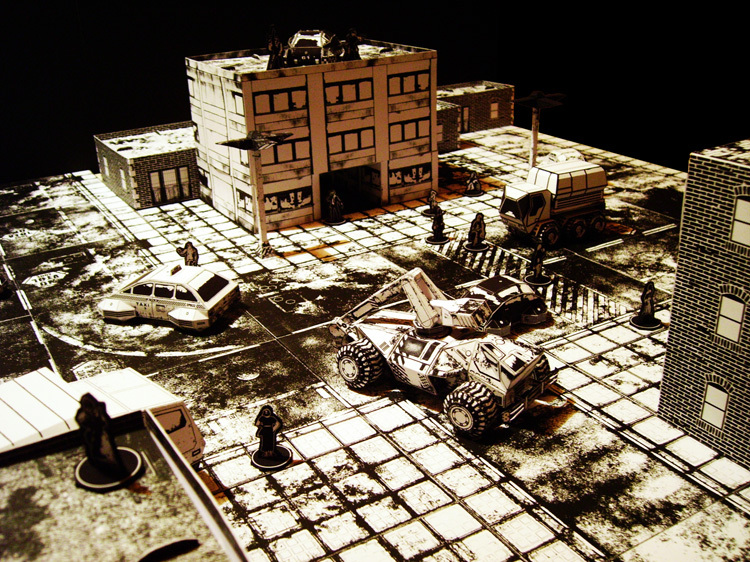 As for rules, I ordered a copy of "The Department", a game that pretty much is Blade Runner without stepping into intellectual property infringement territory (try saying that three times in a row); Replicants are Fabricants, it's not 2019 but rather the 2070s (I think), and the role of artificial beings is different: While Replicants are designed solely for off-world use in colonies and such, Fabricants are more like humanoid androids that threaten to replace all human workers because of their cheapness and reliability. 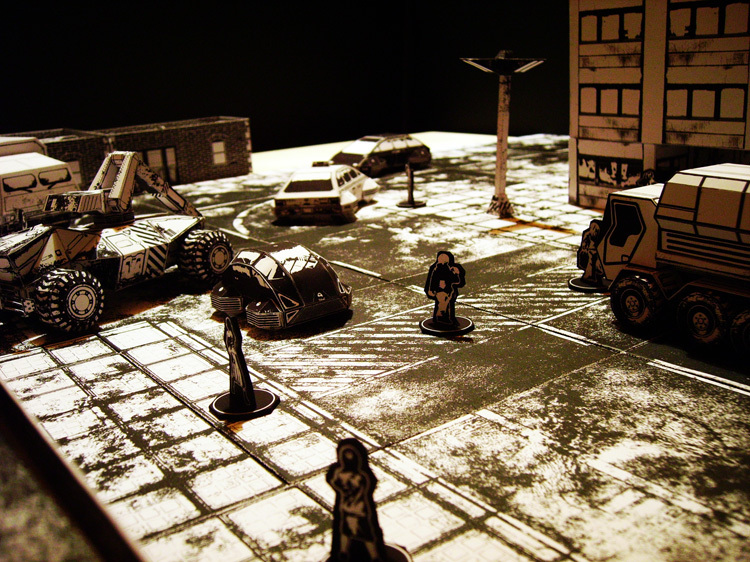 What I needed was an urban landscape with lots of buildings and vehicles for cover, as well as lots of Standees for simulating crowds of random people on the streets. 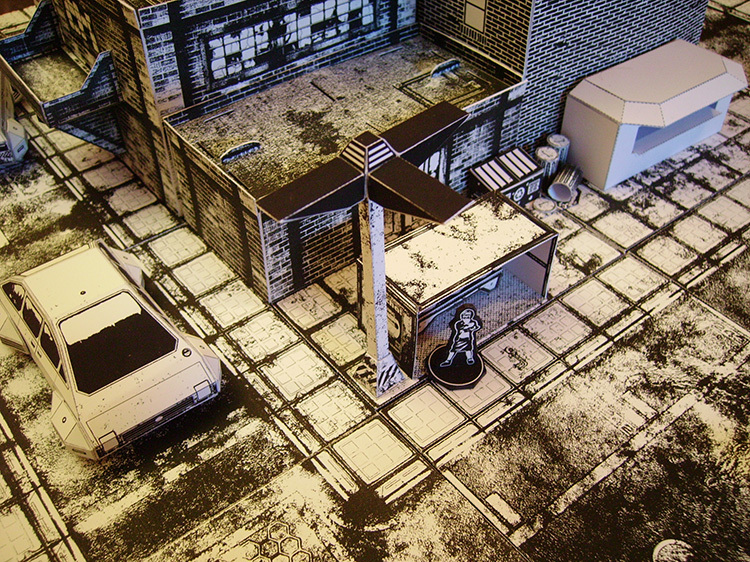 And a more "noisy" look from "Streets Of Titan" with details like water puddles, parking spaces and weird "NO VTOL ZONE" markings. 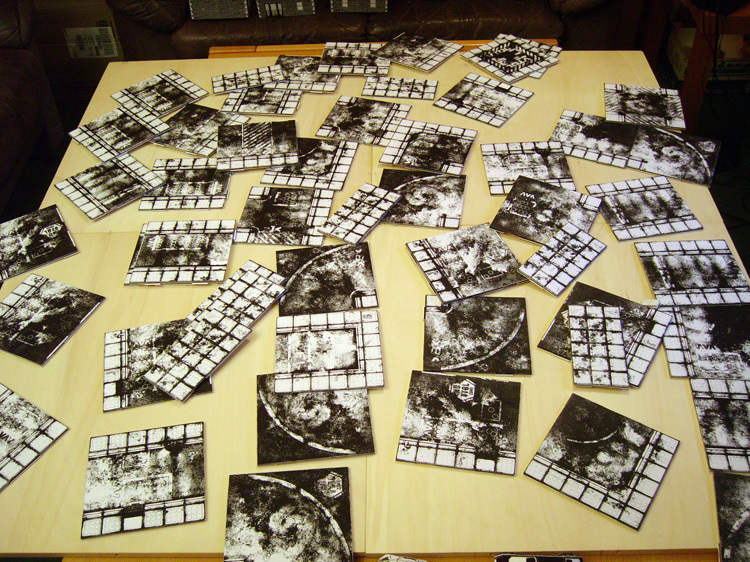 Because I knew I had to convert every single image manually to black & white, having all that detail meant that it would just show up as random shapes instead of anything recognizeable after desaturation. I ultimatively went for the future look because, you know... It's Blade Runner! 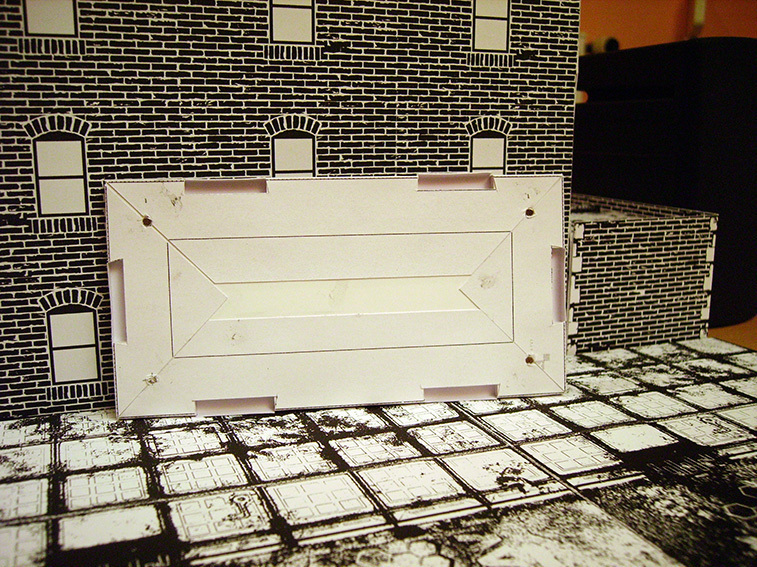 For buildings, I discovered (well, I knew the before, but never considered making them) WWG's excellent line of SwiftScenic structures, boxy buildings that are easy to cut and glue and that fold flat for storage. Never being one that is satisfied with the vanilla options, I heavily modified the files so I wouldn't be restricted to 6x6 inch buildings. Now I'm able to create structures that have walls of 3, 6 or 9 inches length, a big improvement when trying to achieve a non-uniform look. In the middle of churning out SwiftScenic buildings I thought to myself "Gee, high office blocks sure look nice in a downtown setting, but what about actualy playing the game?!?" The problem with high buildings is that they block player's line of sights, it soon becomes awkward having to stand up and bend over the table to see the action. 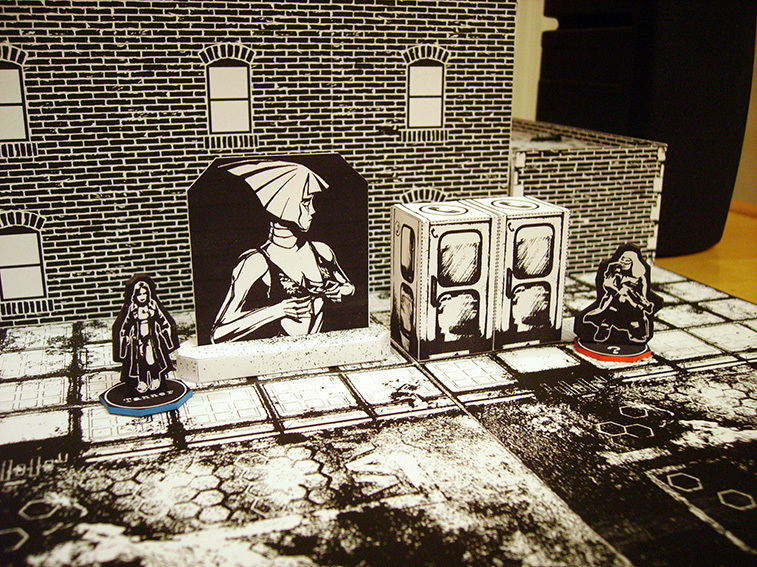 Moving figures in narrow alleyways also becomes next to impossible without bumping against the scenery. 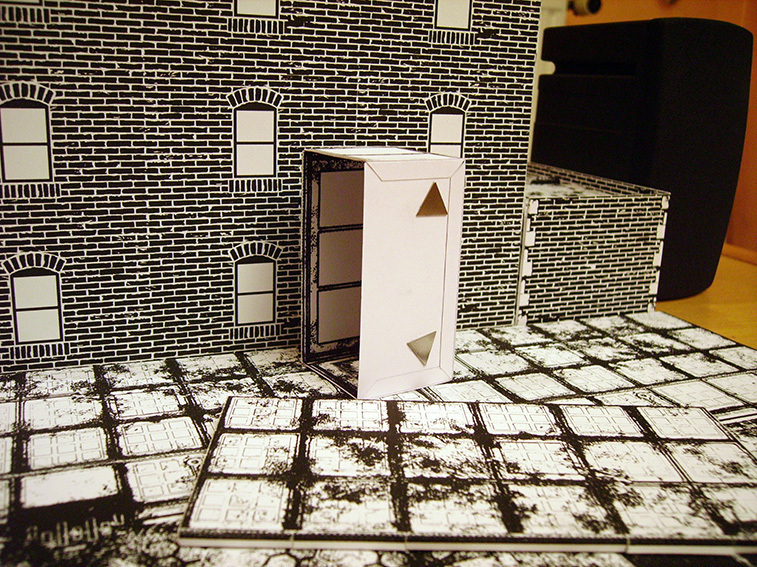 In the end, I limited myself to one-story buildings, just imagining that most of them are actually higher. 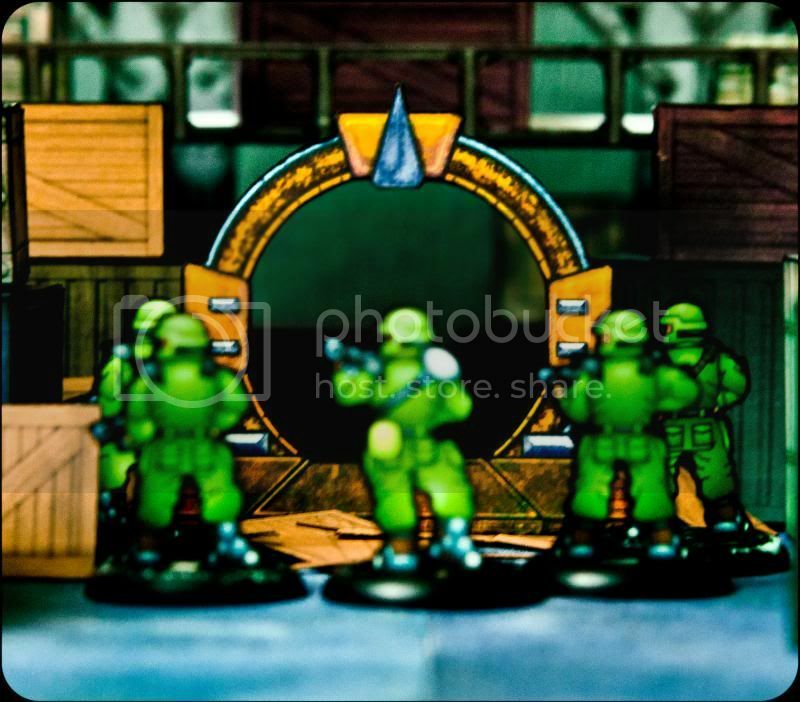 If you have ever played X-Com, you will probably have "cut off" all uper levels as well when in BattleScape view. Next stop: Vehicles. 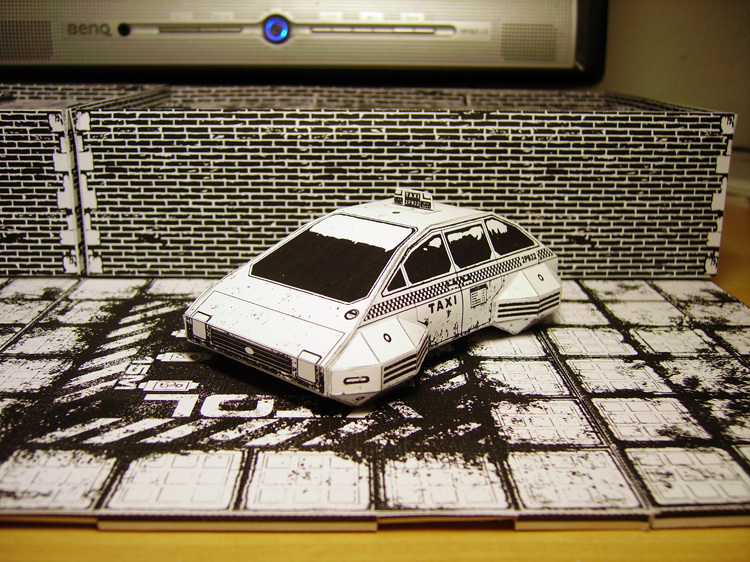 there aren't too many choices of slightly futuristic civilian vehicles available in paper, but again, World Works Games got what I need. 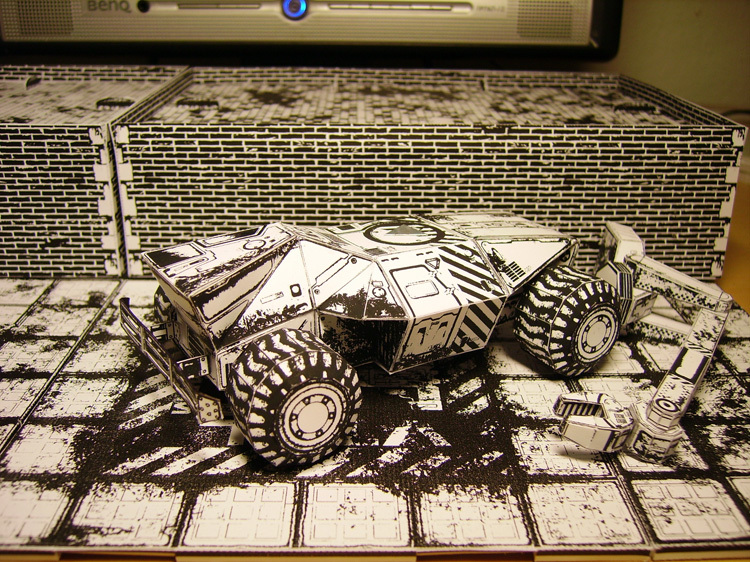 Paper model designer Mel Ebbles created a nice range of paper vehicles for WWG, and I pretty much used everything that didn't look too militaristic. 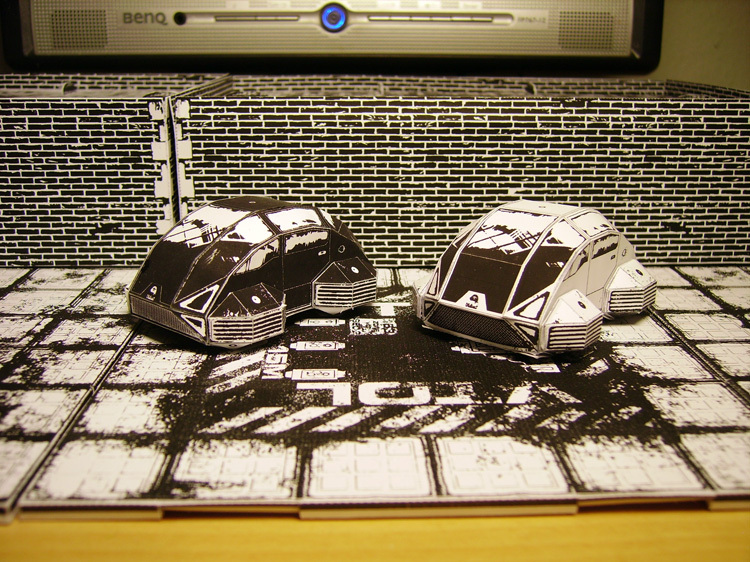 I also got hold of two cool paper model trucks from other sources. Again, everything had to be converted to black & white, which in the case of the Ebbles / WWG vehicles meant editing every detail like headlights, windshields, bumpers etc. seperately. On a side note, doing everything in black & white meant I wouldn't have to worry about edging anything because white paper showing through could just be counted as further details or outlines. This fact helped speed up the build process. 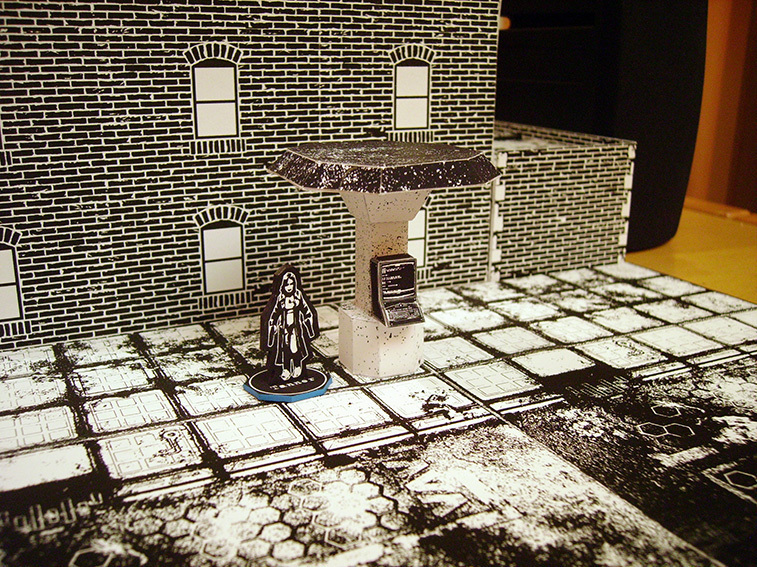 The Standees where again made from the vast archive of suitable 28mm miniature photos I have assembled so far, with (among others) miniature images from Arkham Horror and Vampifan's collection re-purposed for my future noirish needs. That sums up the basic project overview, In the coming days I will go into further detail concerning the buildings, vehicles and Standees. P.S. : Things I learned from this project: Future motorists apparently need to be reminded every 10 meters that they are in a NO VTOL ZONE. A big hover limousine, perfect for the future corporate executive! A nice little model. This is what most commuters would prefer, an affordable vehicle that fits in all spots. Also available in unmarked variants for more subtle police work. This thing is huge! It also looks simple but was actually not that easy to build. Water and chemical/oil tanks are available as well. I had to re-do the complete upper parts because they were painted in a desert camouflage theme I really didn't like, that's why it looks too clean now. Still a cool model. This is one huge vehicle! I printed it at 75% and it's still a monster, but a very cool and detailed model. It was fairly easy to build, the hydraulic arm was fiddly though. 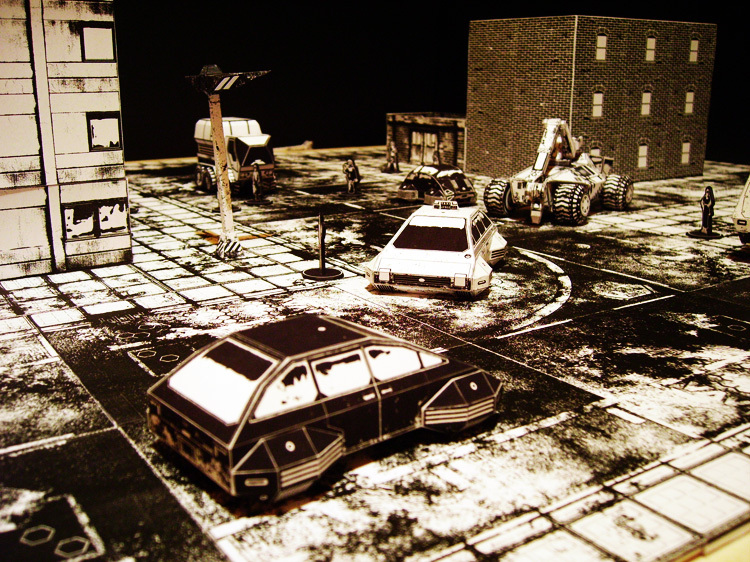 The model comes with multiple options and add-ons for different roles, such as missile launchers, communication arrays etc. I chose a construction yard theme but didn't add the optional support pillars and I put a magnet into the arm so that it can be turned and removed. 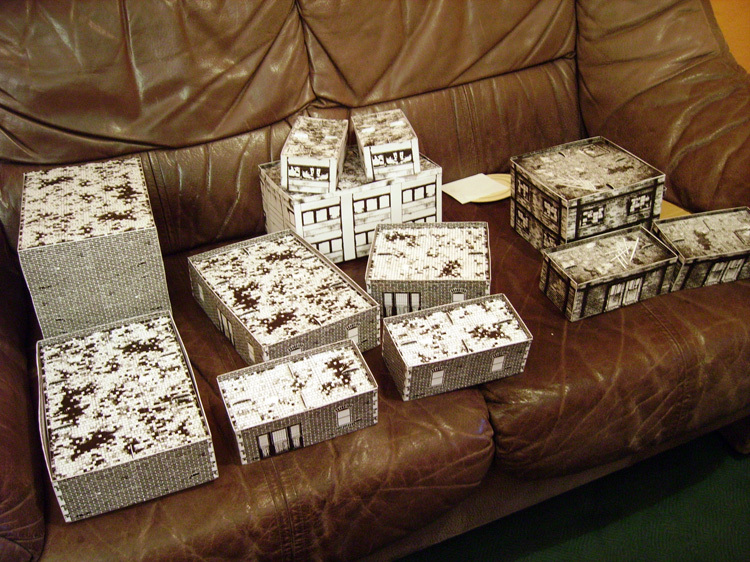 Heh, I had the same feeling about the buildings... made a bunch of Worldworks and Fat Dragon models with 3-4 storeys and they looked good until I decided to play. I've been thinking of building the Samsara as it looks great but was afraid of the difficulty. Again thanks for sharing, these are very inspiring photos. The Samsara is my favourite model, it's no beginner stuff but far from being an expert kit. The chassis is made from three large parts, then there are the four wheels and cockpit, as well as optional axles. 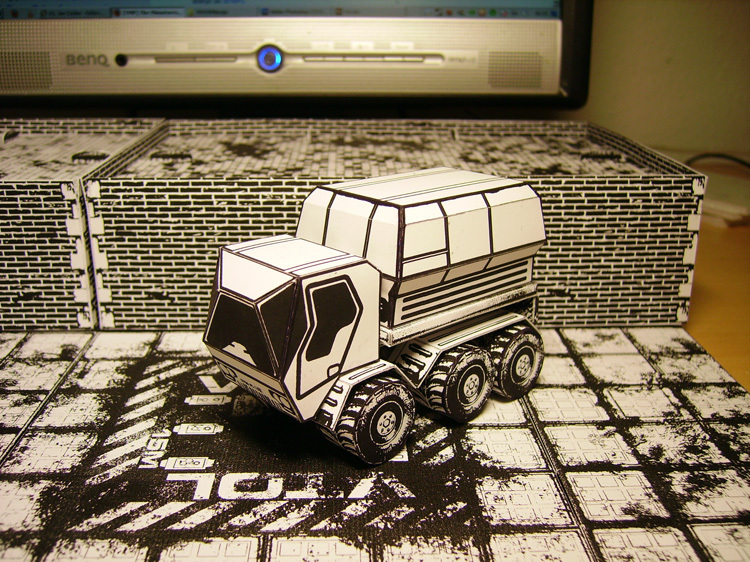 Hard to go wrong with Topo and Ebbles Vehicles. Maybe I'll just add some from TRON. 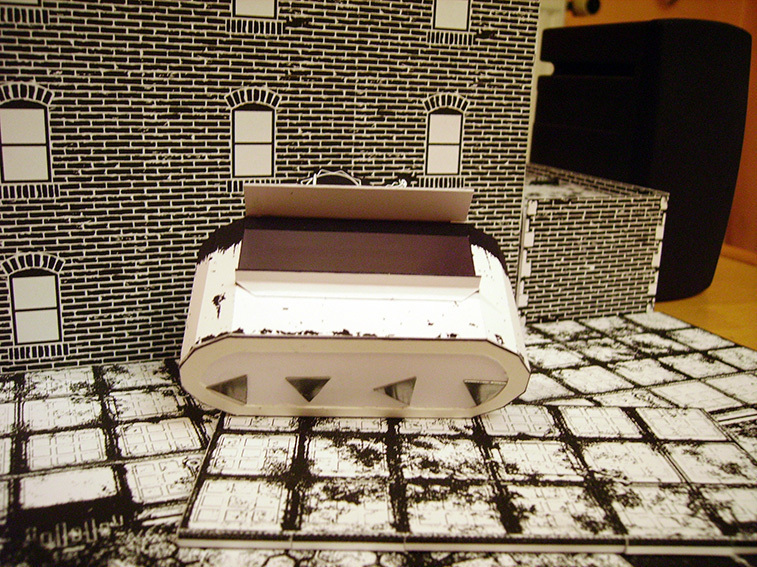 Frankly Topo's hovercraft in civilian livery might work. 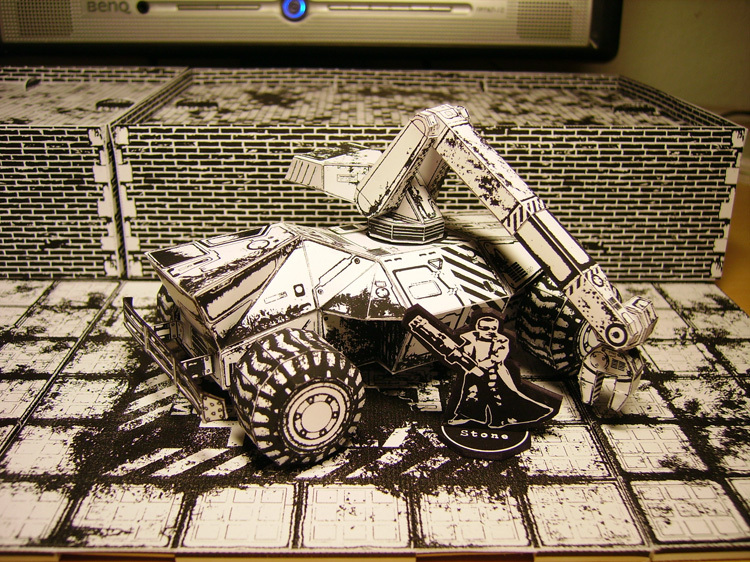 Or you could use the GhostofMan.com Speeder Truck, but you can always mod the back end. Thanks for the suggestions, I'll look into them! So here are a couple of the Standees I created. Most were just converted from stuff I already had. Thanks to all who made their images available to me, much appreciated! Characters have their last names on their bases, while support NPCs have different symbols to better see who they are from a distance: A police star for state police, riot helmet for riot officers and a chemistry glass (?) for the lab technician. There's also three rioters with a flame symbol. They are used in one particular scenario in which a mob protests outside a manufacturing plant and generates rioters. Random civilians, can't have enough of them! I'm very happy how this turned out, with nice gritty textures and the warning stripes that every sci-fi scenario seems to have in abundance! The design is also pretty ingenious (shameless self promotion here), it breaks down into three parts for easy storage, and most importantly, a small magnet can be inserted (and removed too) that slied through the pillar to the base, this way the whole streetlight can be attached to another magnet which is inserted into the ground tile. 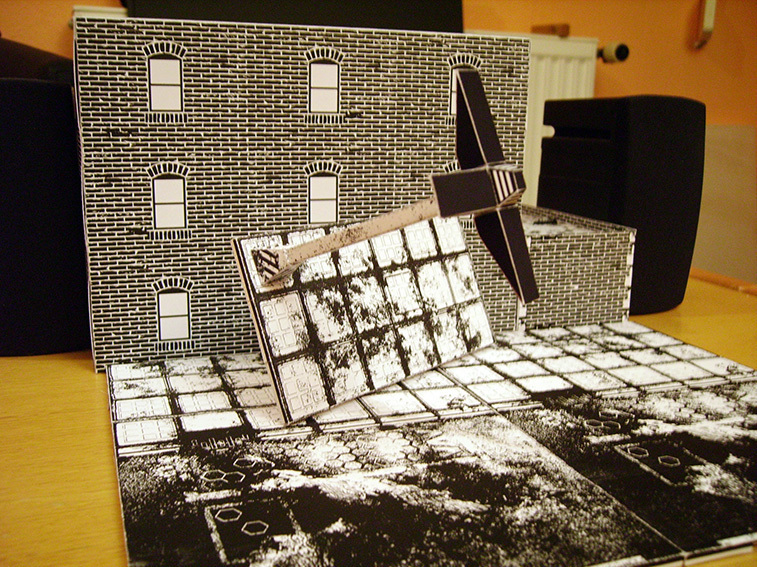 Should someone bump into the prop during play it will not fall over and in fact the tile with attached prop can be tilted 90 degrees sideways without coming off. Maybe I'll detail this system further in the future. I took some inspiration from the asia food vendor from Balderunner when designing this, but it came out generic enough that it can be used in modern scenarios as well. It needs texturing of course, and I plan to add a big chinese dragon sign on top. 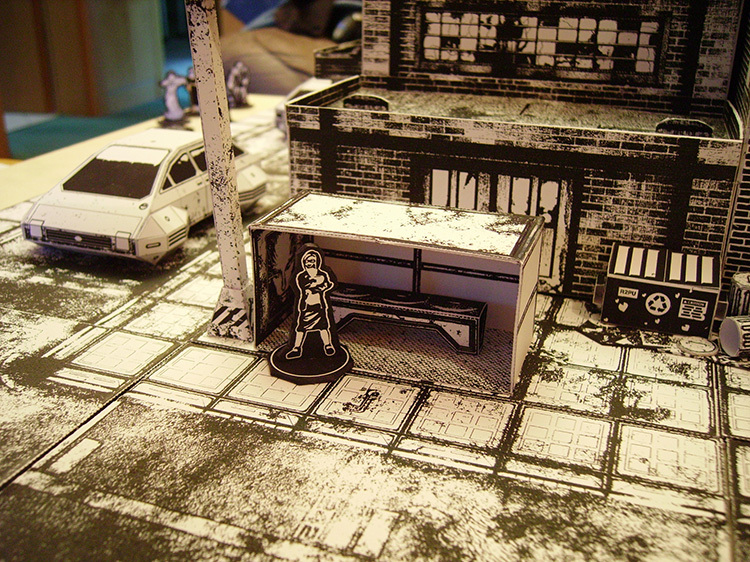 The garbage piles are my favourite prop, it helps clutter up the scenery and they look great in alleyways or just besides a building. 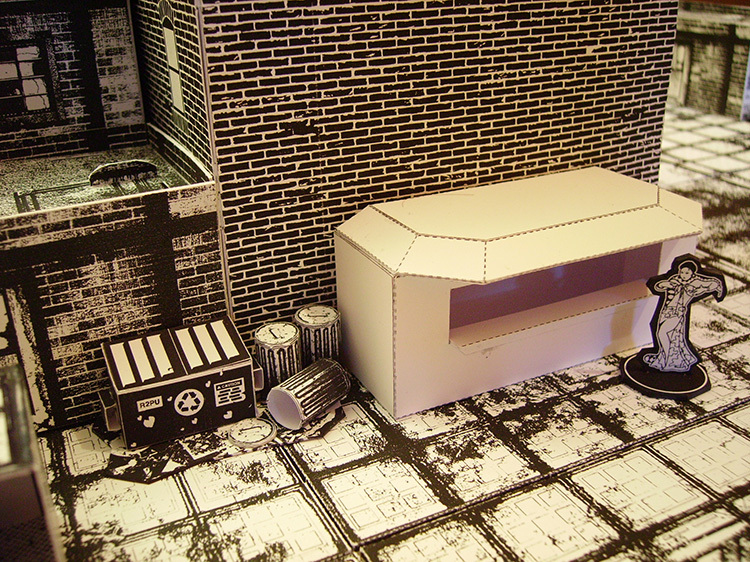 Container is from Mega Miniatures and garbage cans are customized WWG items (the original ones are far too large). The billboard is meant to have a concrete or metal base and a big holographic projection with a possibly animated advertising. Works great as cover! The Power Converter is just something I made up, I wanted to have an interesting looking mdeisum sized structure. It could be anything really. Your 3D models look great. Can't wait to see them textured. 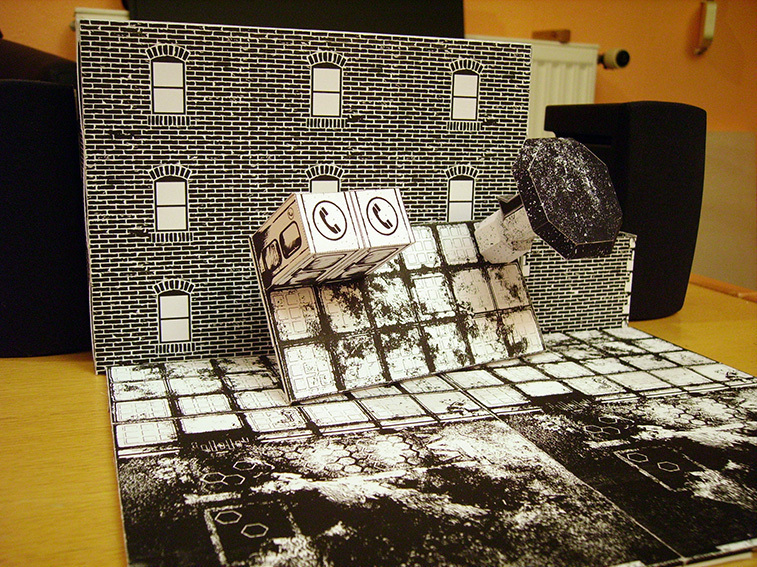 There's something cool about black and white texturing and paper models. It's like underground comics or graphic novels coming to life. 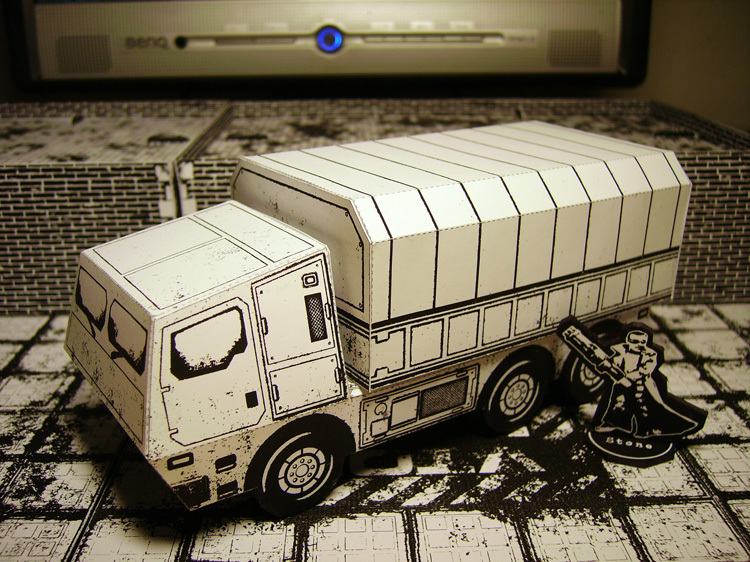 Maybe this is one good example of unique style for paper models that sets them apart from "proxies" as many people (not in this forum obviously) see them. 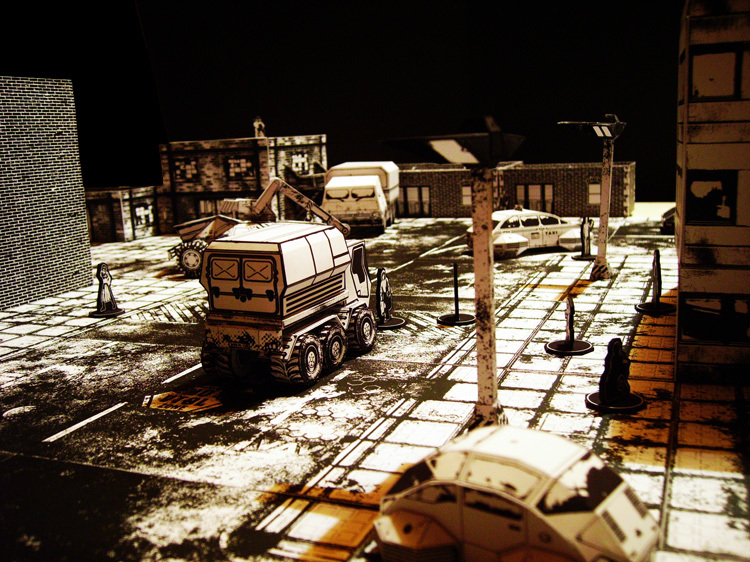 I agree, it's important the paper models fit in with their surroundings, I generally use paper models and miniatures exclusively and try to maintain a certain standard of artistic quality. Having everything in b&w helps this further. 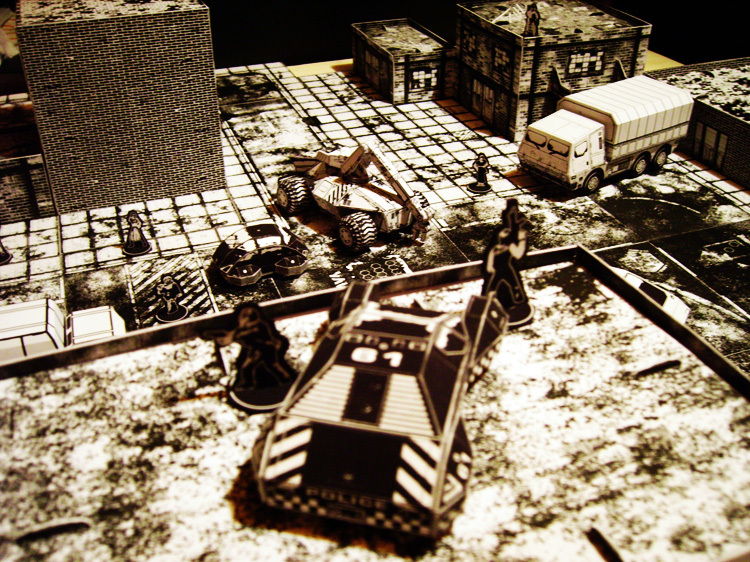 I often see tabletop wargames that have a mix of materials and styles and it just doen't look good, so uniformity is certainly important. This is a great thread. The stuff you are building certainly makes for great pictures. Does the effect wear off after a long night of gaming or are people constantly jazzed about how cool the world looks? Absolutely AMAZING so please keep posting photos...!!! You might consider some (still very subtle!!!) 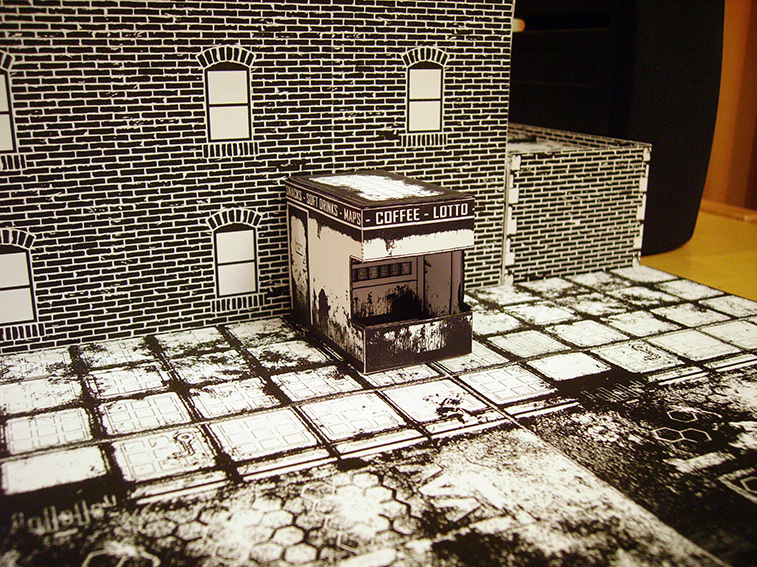 color modifications for some parts/elements of diorama (vide kinda bluish walls on pictures?) -- perhaps vehicles might be slightly "metallic" (just add some gray-metal layer) and some buildings (or other chosen elements of scenery?) could be sepia or other (more warm perhaps?) tonality BUT still *monochromatic* ones. I'd be courious to see it in reality, to see how B/W becomes when surrounded by a "real world"
Mesper's post made me think at "Sin City" (the movie) where the only color you see is red (BLOOD red, RGB255,0,0 for everything red), and then everything else is in B/W (if i remember right...). Street gangs and industrial espionage. Yeah, I just saw that. Nice to know they're further expanding this universe. I textured some props and modified the Diner, it now has the White Dragon neon sign above it from Blade Runner. I also coloured the bases of my Standees blue for cops and red for suspects. This should help quickly identifying figures on crowded tables. 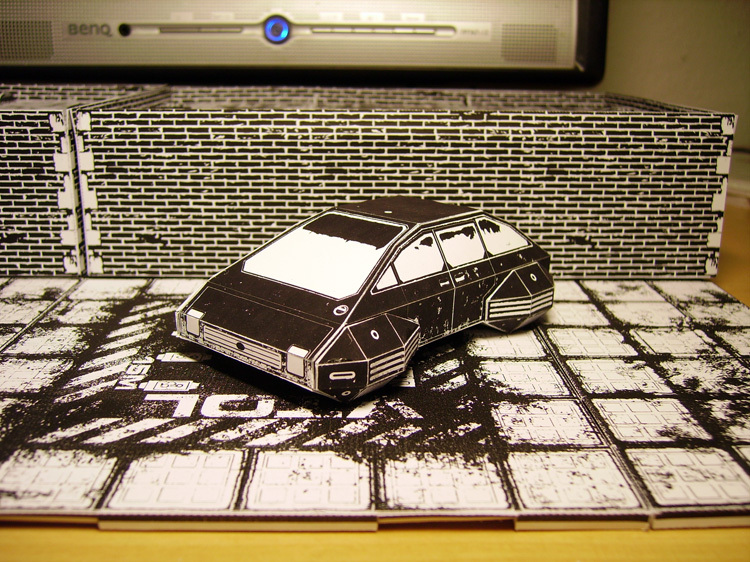 Another advertising billboard, the image comes from the cover of Cyberpunk 2020's chromebook one. The telephone booths are from WWG. 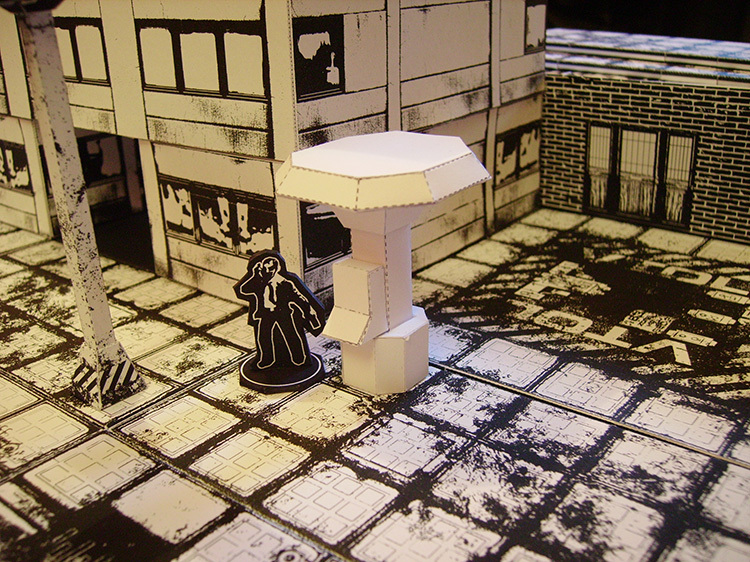 A small kiosk, from WWG's Mayhem Services set. The White Dragon Diner, the structure is pillshaped and has a small roof of corrugated sheet metal and a big neon sign on top. Inside, I glued a "noirified" photo of a bar to the backwall and put a Standee of a chinese chef in there, it amlost looks like in one of those fold-up books, or a theatre stage with 2d props. Now for something different, I mentioned that I use neodynium magnets to hold props in place, here's how it works. I drill holes to the underside of the tiles in all places where I want "anchor points". I insert the round magnets (they can be removed) into the holes. Most props have either magnets inside or small pieces of metal on their undersides. 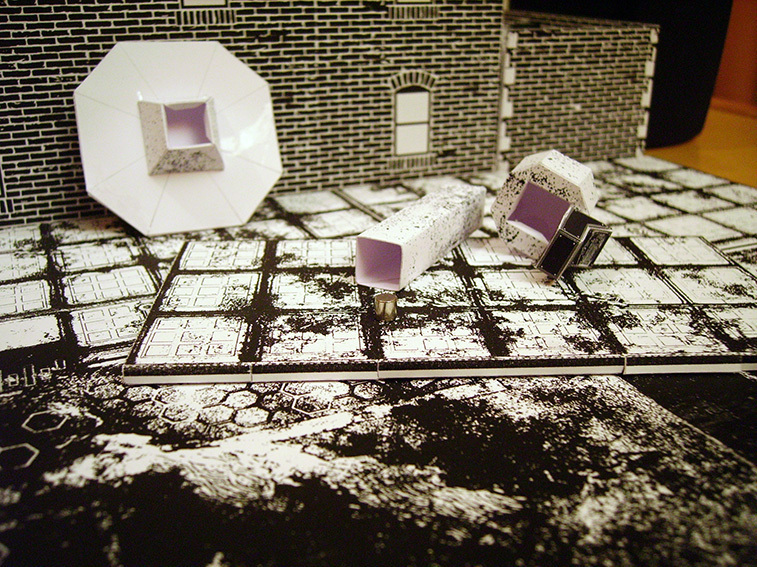 The streetlights and terminals can be disassembled into three parts. A magnet can be inserted that will slide through the pillar. When everything is assembled again, the magnet can't fall out. The prop just snaps to the anchor point and will stay upright in place even when bumped against. 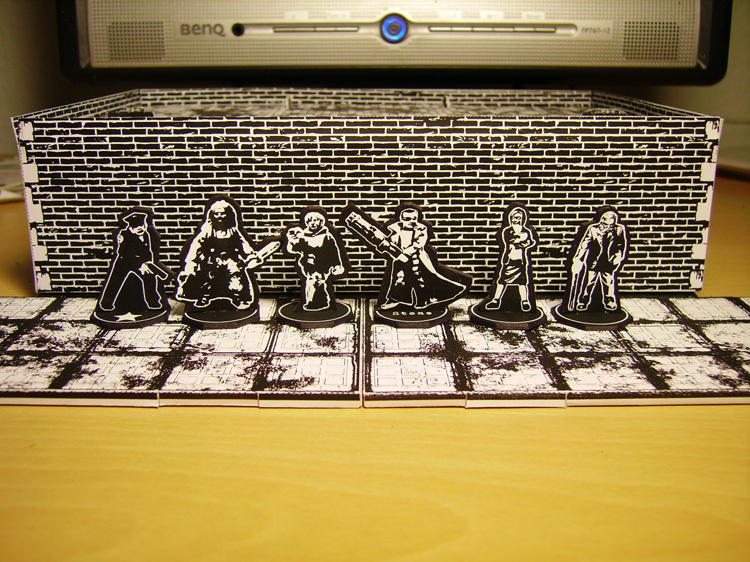 Here's another, older project that I used a lot of magnets in (it's now in possession of Vampifan). 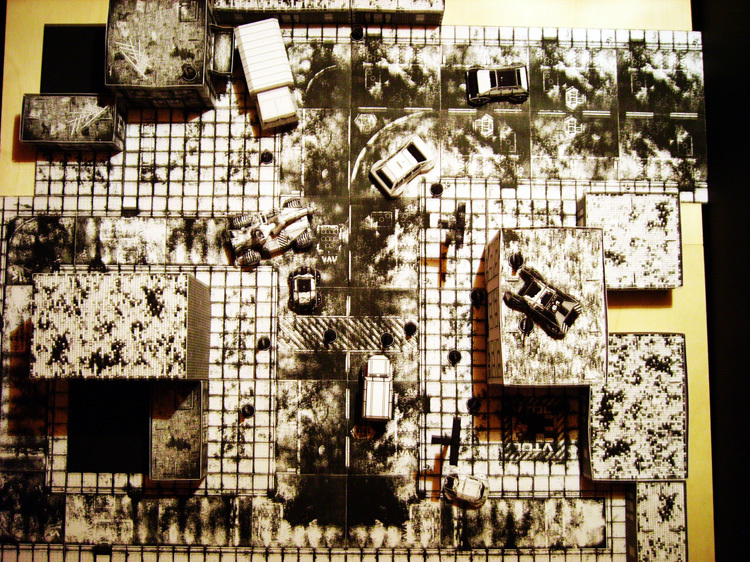 Oldschool Mayhem City: Fun with magnets! I hope you enjoy reading this and maybe I can inspire some fellow hobbyists to try something like this too. I'd certainly liked to be surprised by what others will do with thosestrange little metallic things! F*cking magnets, how do they work?!? Yeah dude, this stuff is killer, excellent work. 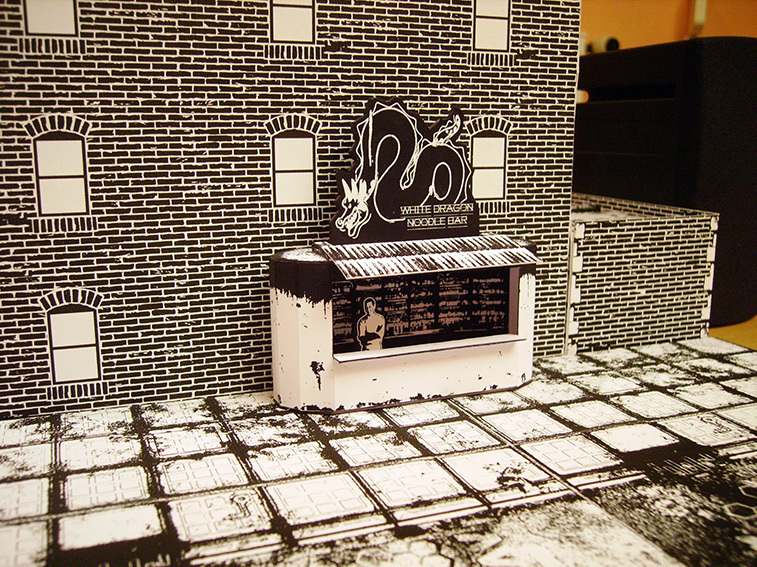 Will you be texturing the original food vendor building, also? I'd be tempted to keep the power converter clean. It just looks 'right' the way it is. To be honest, I scrapped the original model of the diner, but now that you have mentioned it, I dug it from the trash and gave it some black outlines to hide the fold marks. I guess I'm just gonna put a seafood sign up there and add some grunge with a brush and black paint. I love the work people do with magnets and papermodels, I just don't have the energy to do that one more step for myself. Love the setup though. Hey, I am really liking this setup of yours. I like the magnet idea too. 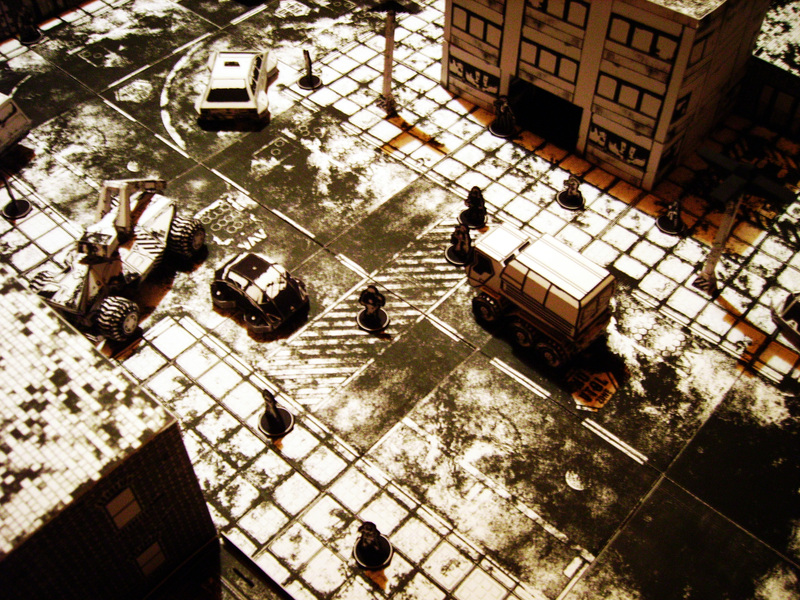 But best orf all, is all the cool vehicles, buildings and people you actually have populating it. I am really like it, job well done.